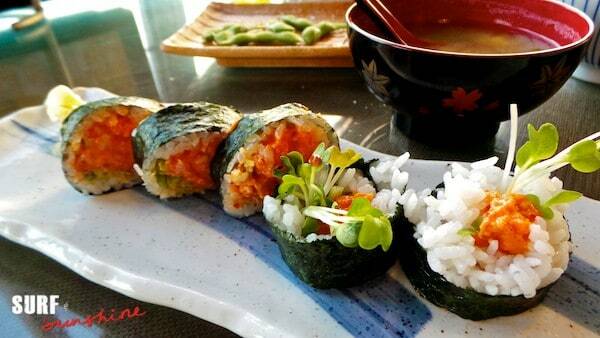 Of all the extraordinary cuisines of the world, the one that I could eat every day and never tire of is Sushi. Sushi just plain makes me happy. Can you imagine how cranky I was while pregnant!??! 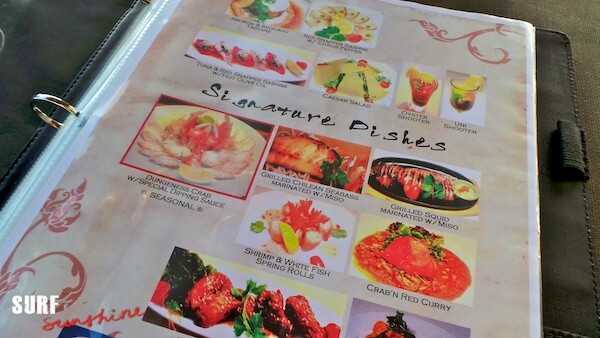 Of course I still went anyway and ate only the fully cooked dishes, but it just wasn’t the same. There really isn’t anything in the world like a fresh Salmon or Ahi Carpaccio or Japanese Red Snapper (Tai) served with a spicy citrus sauce topped with gold flakes. Luckily, I live near the ocean and have such a large choice of sushi restaurants to eat at, that I honestly have not visited even half that are near me. So when Ben asked “What’s for dinner” the night before I was headed to BlogHer, I already knew I wanted to try a new local Sushi restaurant and I also knew which one. We actually live a short bike ride away from the Redondo Beach Pier, but for one reason or another (it’s probably the tourists), we tend to avoid it. It’s a shame really, because it’s quite the spot. 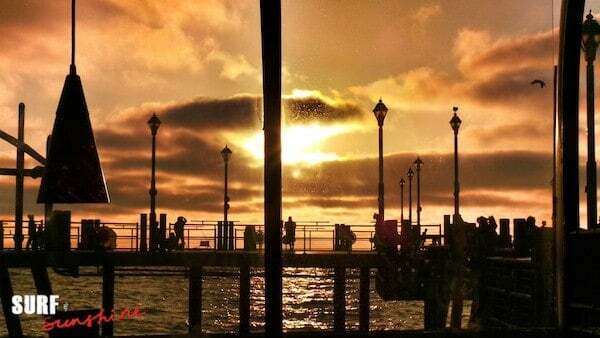 An eclectic collection of dining options, bars, shops and even a mini amusement/family fun center hidden underneath make the Redondo Beach Pier a popular place to visit year-round. 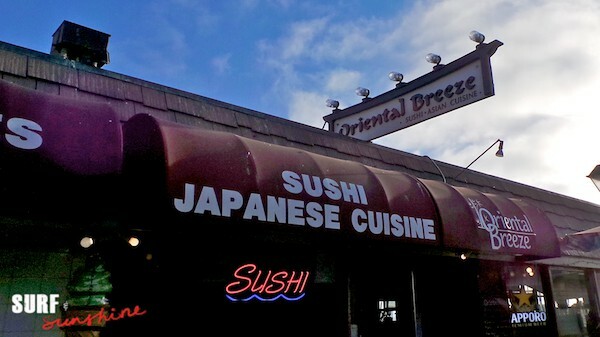 I’ll admit that when I initially purchased my Restaurant.com Certificate to Oriental Breeze two years ago (yep, you read that right – these puppies never expire! ), I *thought* it was a Chinese restaurant. Once I realized it was Sushi, the mission to convince Ben to go was on. Seeing as this night was “my choice”, there was no convincing required. 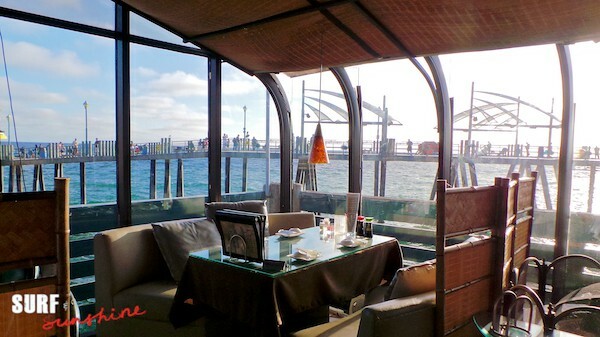 Only open for dinner, Oriental Breeze is located about midway down one leg of the Redondo Beach pier. Shabby and unassuming from the entrance, once inside you are faced with and immediately greeted by the Sushi Chefs and bar. Take a walk to the right into the dining area and be prepared to be pleasantly surprised by the cozy chic lounge dining tables along a wall of floor to ceiling glass. Perched west-facing with the Pacific Ocean’s waves crashing under the pier below, this is the perfect spot for a romantic sunset dinner. This is the real deal folks – an authentic Japanese Restaurant where the menu is written in Katakana and Kanji and photos of the dishes are needed. If you’re a fan of Sake and Soju (the Korean version of Rice Wine), Oriental Breeze has a great selection and offers almost all by the glass. 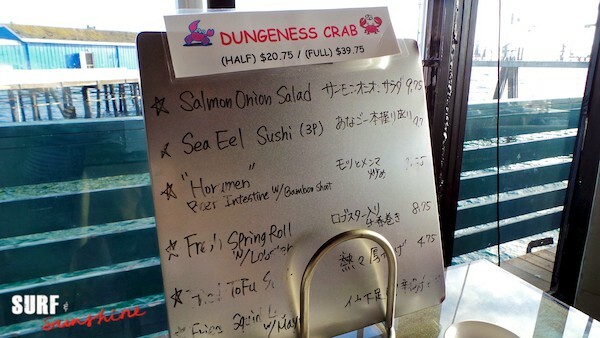 If you’re feeling adventurous, try something off the daily special menu. 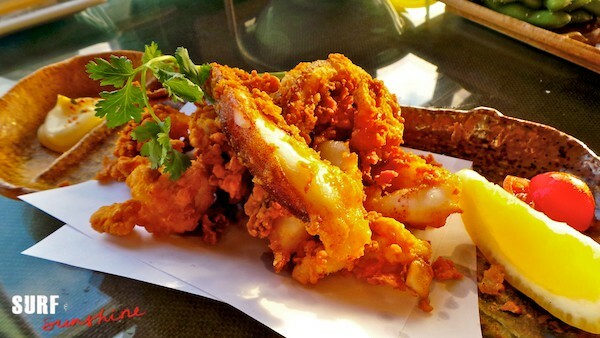 We went with the Fried Squid Legs (Calamari with just the tentacles) with Jalapeno Mayo and were not disappointed! 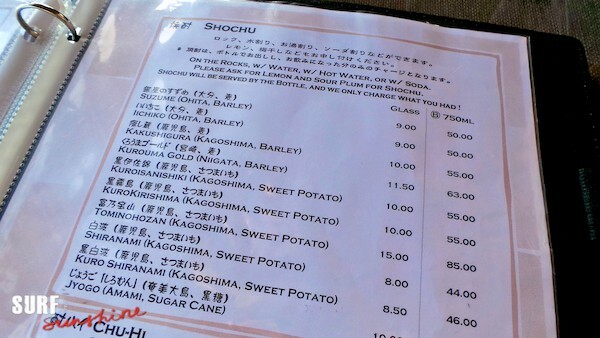 I was thrilled to see that they had Shishito Peppers on the menu. 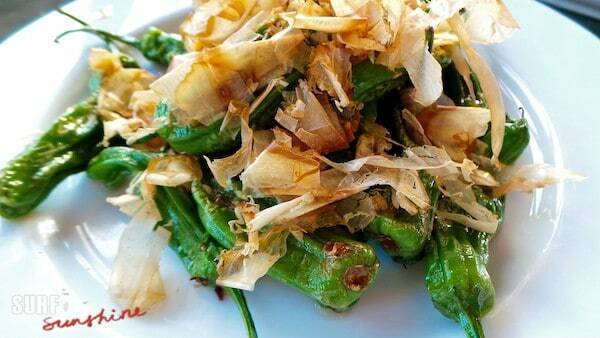 These are sauteed in a delicious sauce with garlic and topped with fried bonito shavings. Akin to Russian Roulette, only about 1 in 4 Shishito peppers are spicy and everyone knows to hand those immediately over to me. 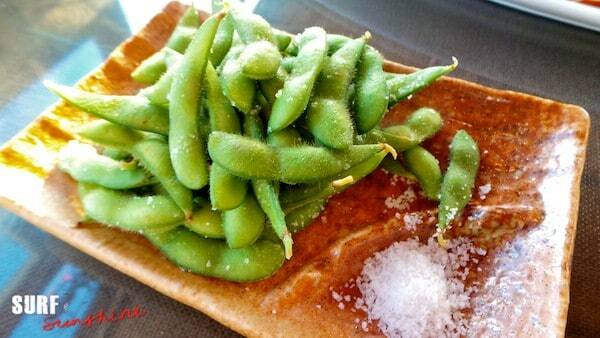 We ordered those along with some Edamame – Whistler’s favorite. Speaking of Whistler, luckily he loves sushi and Japanese fare as well. Upon first glance you would think this isn’t a place where you would want to bring children, but I’m happy to report that it is. To our surprise, the waiter brought over kid friendly dinnerware and a sippy cup, without being asked. 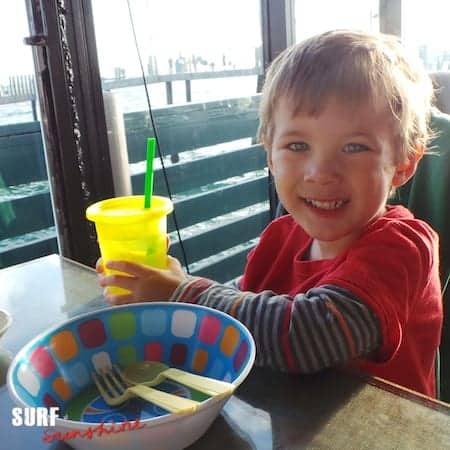 And even though they don’t have a specific children’s menu, they do offer a variety of kid friendly items like Chicken or Beef Teriyaki, French Fries and Gyoza (Potstickers) to name a few. 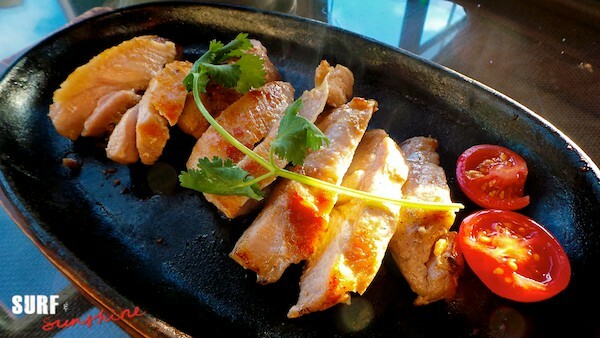 We ordered the Grilled Chicken and a bowl of white rice for Whistler. 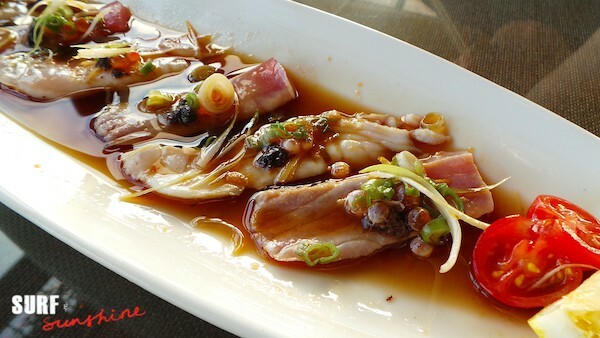 Ben and I shared the Tuna and Red Snapper Sashimi with Hot Olive Oil (below) and a Spicy Tuna Roll (top photo above). 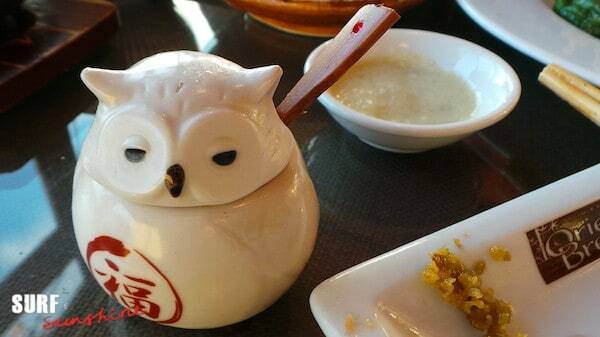 *TIP* Ask for “The Owl”. This adorable little ceramic bird contains what I call like to call Japanese Crack. Its a spicy pepper and citrus paste that is AH-MAZE-ING on everything! We all cleaned every plate and had full, happy tummies. And if this wasn’t enough, we were treated to a gorgeous Southern California sunset towards the end of our meal that I didn’t even have to get up out of my seat to enjoy! Nice review. I’ve always been curious about this place. Thanks!